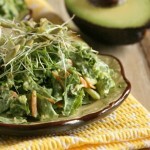 Fresh greens smothered in a vegan salad dressing made creamy with avocado and almond milk. In a large bowl, combine the kale, broccoli, scallions, and carrot. Reserve the pumpkin seeds and sprouts for garnish. 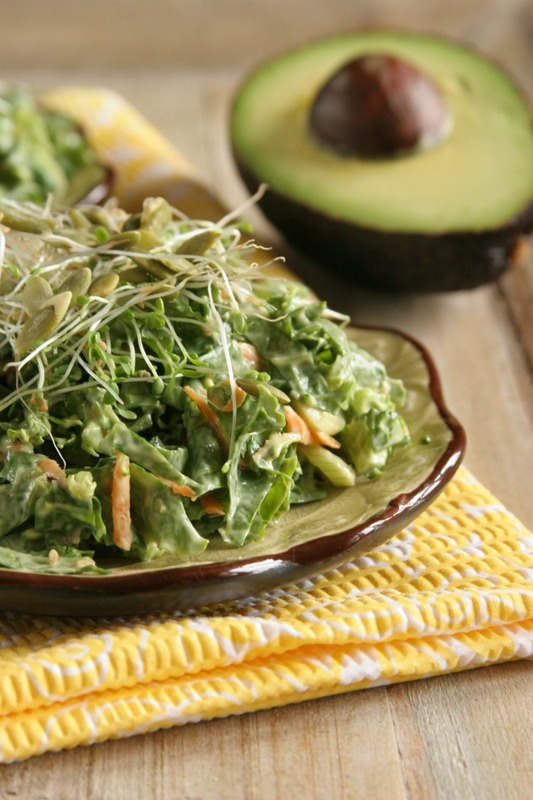 Now, make the dressing by scooping the avocado flesh into a blender or food processor. Add the milk, lemon juice, coconut nectar (or medjool dates), vinegar, olive oil, and mustard. Pour the dressing over the salad and toss to coat thoroughly. Season to taste with salt and pepper. Garnish plates of the salad with the sprouts and pumpkin seeds. Coconut Nectar – to make this recipe comply with Vibrant Life Cleanse Program, swap out the coconut nectar for pitted medjool dates.